This is a wedding template suite that I designed around the theme of “winter wonderland.” There are a variety of pieces in this set, including a ceramic ornament that can be used as a guest favour. Square invitation (top left) – 5.25″ x 5.25″, all text customizable. One customizable line of text for the names of the bride and groom, plus five additional lines of text. 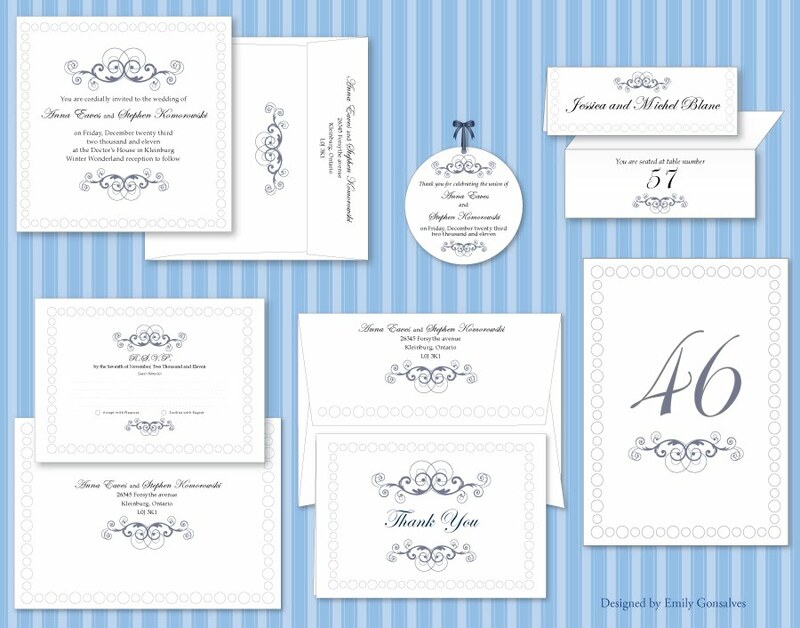 Invitation envelope (top left, underneath) – 5.45″ x 5.44″, customizable text for both the to and from addresses. Foldable Reply Card (bottom left shows inside view) – 5.6″ x 4″, editable text inside with blank lines available for invited guests to fill in by hand. Flat Reply Card (bottom left) – 5″ x 3.5″, editable text with blank lines available for invited guests to fill in by hand. Small envelope (front: bottom left, underneath and back: bottom centre, underneath) – 6.5″ x 4.7″ (A6). Fits foldable reply card and thank you card. Customizable text for both the to and from addresses. Ornament favour (top, centre) – 2.87″ diameter, ceramic, weighs 1.4 ounces. Editable text. Place Card (top right) – folded size 4.875″ x 1.75″, not available on Zazzle. Table number (bottom right) – 5″ x 7″, numeric text is customizable. Thank you card (bottom centre) – 5.6″ x 4″, editable interior text for personal note or leave blank to write notes in by hand. "Wonderland" is a very apt name here! This is beautiful work.